So i’m not a blogger. Not at all. I’m terrible at all things writing related. My intentions for this blog are to keep my creations in the kitchen organized & my thoughts about those creations noted. Who knows, maybe my blog will inspire others to work their creative magic in the kitchen! For me, the kitchen is my oasis. I have a lot to learn about cooking in general, but boy can I follow a recipe. I like to add my own personal touches to recipes I find to make them somewhat my own. You have to start somewhere, right? If i’m having a bad day, I like to retreat to the kitchen with a glass of wine or an ice cold beer to help soothe my soul & my mind. I find something I want to make and go to town. 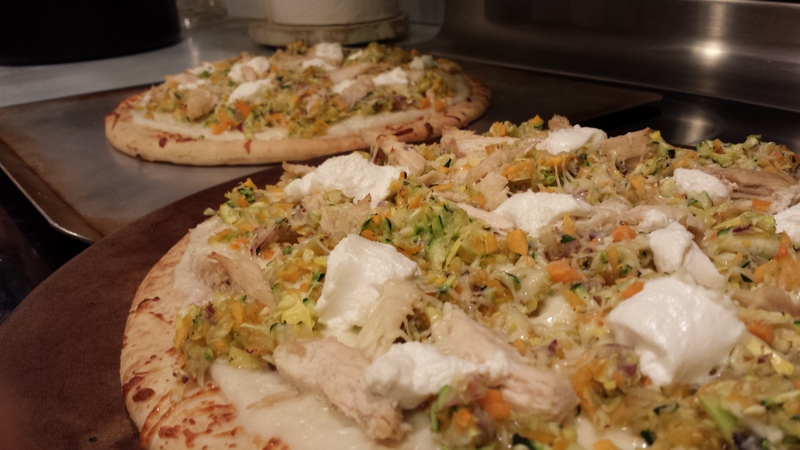 This Squash White Pizza i’m going to share with you all is one of my favorite things to make. It’s so simple, but so good. I was inspired by a pizza that was on special once at a restaurant in Park City, UT called Vinto. I can’t recall what the pizza was called, but it was incredible and I’ve been tweaking this pizza recipe ever since. It still has a lot of room to grow, but that’s what’s so fun about it. Every time I make it, I try something new with it & it just keeps getting better & better. The nice thing about this recipe is that you can be as creative with it as you want and i’m pretty sure it won’t disappoint. It’s basically a white pizza with cheese & veggies. Can’t go wrong! I’m a huge lover of cheese & white sauce pizzas. Veggies are good too. I used to use Alfredo sauce as the white sauce for the pizza. This time around I had some extra time on my hands and whipped up a creamy cauliflower garlic sauce for my white sauce. It did not disappoint. The Alfredo sauce definitely gives it a creamier taste. If that’s what you’re going for, then by all means go that route! The cauliflower sauce to me, was a little more refreshing – if that’s even the right word to describe it. I love cauliflower, so I was immediately sold on this sauce. Also, it’s got to be slightly healthier than Alfredo sauce. It’s a win win in my books! This time around I added some chicken to the top of the pizza for some protein. I marinated the chicken in a Lemon Rosemary Marinade for a few hours. I baked a chicken breast in the oven at 450 degrees Fahrenheit for about 20 minutes or until the chicken was cooked through. Afterwards I sliced it up and placed in atop the pizza. The pizza is just as good without it. If you don’t like meat on your pizza, just follow the recipe below! This is just one of the many possibilities for this dish. I’ve never actually written a recipe before. Please be patient with me! This pizza is really flexible so the veggie proportions can easily be tweaked depending on how much of each veggie you like. I like a little more zucchini in mine, but that’s just a personal preference. If you like more butternut, add more! Same with the cheeses. If you like your pizza cheesier, by all means add more cheese! I’m honestly guessing on my proportions. I always have more leftover once I start sprinkling everything onto the pizza anyways. Preheat oven to 450 degrees Fahrenheit. Place yellow squash, zucchini, butternut squash & red onion into food processor. Process until everything is nicely chopped. Place into a bowl all mixed together with the salt/pepper & set aside. Brush pre-made pizza crust with olive oil. Spread white sauce onto crust. You can use Alfredo sauce if your pressed for time or want more of a creamier sauce. I have embedded the link to the sauce I made, which only takes about 20 minutes to make from start to finish – (Creamy Garlic Cauliflower Sauce Recipe). Once you have the sauce spread out on the crust leaving about a 1/2 to 1 inch crust free of sauce start adding some of the cheese, sprinkling it evenly atop the sauce. Next start sprinkling the veggies. Sprinkle as much or as little as you’d like. Once you have the amount of veggies you like layered onto the pizza add some dollops of ricotta cheese atop the veggies. Try to space it so each piece of pizza has at least one dollop of ricotta on it once sliced. Place the pizza into the oven for 8-10 minutes until cheese is melted and crust is starting to crisp. If you used the creamy garlic cauliflower white sauce as your sauce, allow the pizza to sit for a few minutes so the sauce can set. ENJOY!